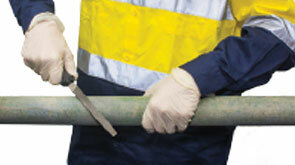 Rapp-it Pipe Repair is simple to use and requires little preparation. 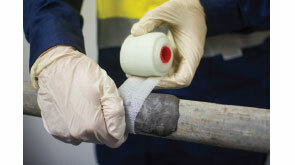 The Rapp-it Pipe Repair System includes a woven fiberglass bandage impregnated with water-activated polyurethane resin and a 90mm stick of Rapp-it Steel Putty. A successful pipe repair can be achieved in only 30 minutes. Shut down pipe to relieve pressure from damaged area. 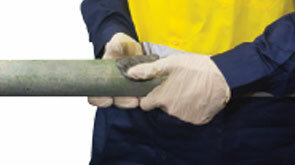 Apply gloves, then thoroughly clean and roughen the damaged pipe area. A clean, rough surface helps result in a successful repair. Knead Steel Putty and apply firmly into damaged area. Putty has a 2-5 minute work time, and the bandage application must begin during this time. Soak bandage in fresh water for 10 seconds. Squeeze bandage 1-2 times while in water to help activation. Quickly wrap the bandage around damaged area, extending 50mm either side of the leak. Pull firmly throughout application. A strong, tight repair is very important. With wet gloves, squeeze the bandage with a rotating motion until resin stops foaming and is set. Allow a minimum of 30 minutes for Rapp-it Bandage to set rock hard. For best results, the completed bandage application should be no less than 10mm thick (12-15 wraps). 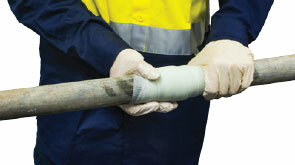 Allow 30 minutes for Rapp-it Pipe Repair System to set rock-hard. The tightness of the wrap is very important to ensure adhesion of Rapp-it Bandage and Rapp-it Steel Putty to the pipe surface. Rapp-it Bandage has a 2-5 minute work life, with full cure in 30 minutes. Water temperature can affect the bandage cure time. Colder water will increase the cure time and hot water will reduce the cure time. Rapp-it Steel Putty has a 4-7 minute work life, with full cure in 30 minutes. 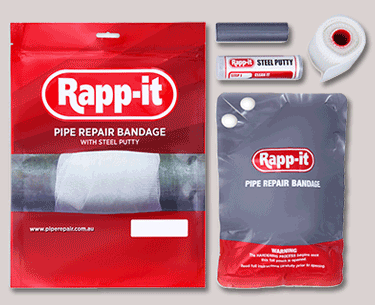 Rapp-it Pipe Repair System now includes a 90mm stick of Rapp-it Steel Putty. Tear off adequate Steel Putty to suit the extent of the damage to the pipe. Rapp-it Steel Putty can be mixed by hand and then moulded into a variety of shapes to fill cracks and holes. When applying to damp, wet or slowly leaking areas work Rapp-it Steel Putty forcefully into the surface and apply pressure until adhesion begins to take effect. Difficult or large applications may require multiple bandages.